Hyundai Motor America have been hit with a number of business challenges recently, and they can now add another to the growing list. They are currently lacking product in the US small crossover vehicle segment while their rivals are loading up for a major push. There is an incredible amount of consumer buzz being generated about the new sub-compact crossover utility segment. This is good news for automakers, with GM already expecting that their Buick Encore, as well as those similar CUV models produced by other automakers to top 400,000 units in sales annually by 2018. If sources close to the company are to be believed, Hyundai of USA currently has no answer for that expected growth coming any time soon. One source close to the carmaker, but who asked to remain unidentified, believes that Hyundai are set to completely miss the boat in the mini crossover segment. He revealed that Hyundai are in the process of looking for a solution to the problem, but as of yet have been unable to deliver any sort of answer. Dave Zuchowski, the recently appointed U.S. chief executive of Hyundai, said that the SUV and crossover segments were very much a part of the plan that will see Hyundai hit a 5% market share in the US. He did admit that there were currently no plans in place to deliver a new model in the subcompact CUV segment. Instead, he revealed that Hyundai would be spending their marketing dollars on bigger CUV’s, with the Tucson and Santa Fe being the vehicles in question. Zuchowski did say that the company was definitely looking at the subcompact market among many of the other activities they currently have going on. He said that there were no immediate plans to add anything into the product cycle, but that the segment was one that they have a definite interest in. The small SUV issue is just one of many currently being faces with in the United States, with stiffer competition from Japanese automakers taking advantage of a cheaper yen being high on the list. They are also facing a lack of manufacturing capacity that the sales teams throughout the country claim is hurting the sales growth of Hyundai. Zuchowski claims that the production issues are in the process of being fixed, albeit slowly. He also revealed that there were no immediate plans to build another factory in the US. 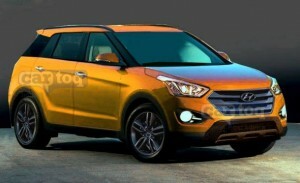 ix25 Small SUV In Works, But Not For U.S.
Hyundai does have the ix25 subcompact SUV in the works, but there are no plans to make it available in the US. Automotive experts see the subcompact crossover category as a “hot little niche segment” and one that will be an opportunity lost for Hyundai if they cannot find a way in. As it stands right now, there are limited models available in the segment, with most of the sales going to the Juke and the Encore. Other automakers are preparing to weigh in, though, hoping to achieve the same success that Nissan did with the Juke. Mazda, Chrysler VW, and Honda area all believed to be delivering a vehicle to the segment soon.